For those that are struggling with not enough power in a 2 motor drive, we just built and tested a 3 motor drive. It works pretty well. You have to mount the 2 motors facing each other so their shafts are visible. Then put a differential between those shafts, and power it with the 3rd motor. Then just control the 3rd motor with a forever loop that 1. turns the motor on and 2. sets the speed to (joya/2 + joyd/2). The extra power allows you to overdrive the final drive for more speed. Also adds a lot of acceleration. I really like it. What are the red shafts??? Just normal plastic shafts, they are available in colors. The triple stack 2x2 black is where we joined 2 short ones together to get the correct length. i dont 100% follow this, how do you steer your robot if three motors are going to one axle powering all of the wheels, even with a differential? The left/right drivetrains are separate, like with the flex bot or most any bot. The differential is on the MOTOR shafts, not the wheels shafts. I will try to put a video up on youtube in a little while. You can see 1 wheel, then 2 wheels, then it stops when 1 wheel is forward and the other 1 backwards. Neat! Great use of the differential. 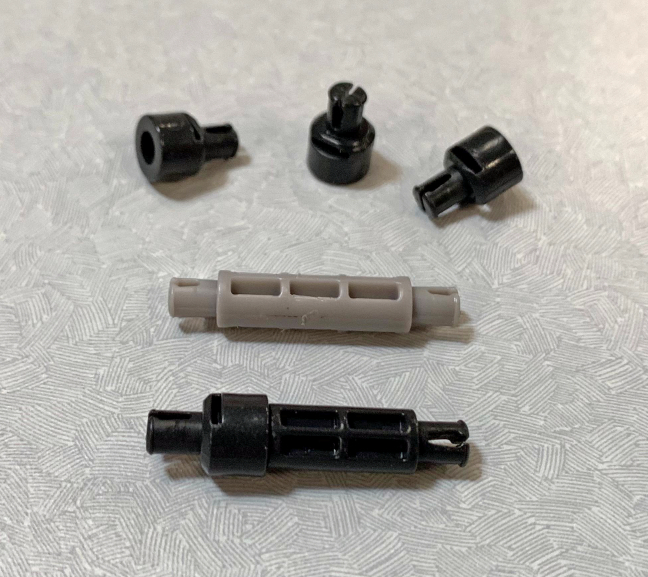 If you are ever looking for a slightly more efficient way to join two shafts together end-to-end, there’s a new VEX IQ part (228-2500-1925) that was created a few years ago for use in the HEXBUG VEX Robotics kits. This part is similar to the 2x2 Lock Plate, but the square hole is offset by one beam thickness (with enough room to fit a Rubber Shaft Collar), and the outside is round. And a few other kits, such as the Balancing Boxers and the Mech Loader model in the VEX Explorer kits. We really like the usefulness of this part, and have been trying to increase our usage of it in new kits where ever possible. @turbodog The use of the differential to add power is very cool, thanks very much for posting the video it will make it easier to explain to the roboteers how this works. @Art_Dutra_IV That’s a great part, any chance you can convince manufacturing to put them out as an item. I can see using them as a shaft extender but also a way to get some extra support for gears on shafts. It’s kind of like what you have when you run an odd wheel drivetrain. You place a wheel in the center line of the robot and that motor runs at half the velocity of the left and right motors combined. both motors going 200 rpm = 400 rpm/2 = 200 rpm. one motor 200 rpm, other motor -200 rpm = 0/2 = 0 and so on. It is a great mechanical component. Is there any .STL file available for printing ? Until the next round of updates to the primary VEX IQ CAD downloads page, I’ve attached the STEP file here for 228-2500-1925. Hello @Art_Dutra_IV Many thanks for adding the file! There are a number of parts I would like to order from the legal parts appendix. We tore apart one of my fields and the kids are all over the 1.5 pitch standoffs… The few we have. Who can we reash out to to try and get more parts available by themselves? I’m a middle school teacher with 20+ teams and I would probably buy them all. The 1.5x Pitch Standoff (228-2500-066) is one of our most requested parts for inclusion in a VEX IQ add-on pack, so it’s definitely on our short list of either new VEX IQ add-on pack ideas, and/or higher priority usage in new VIQC fields or HEXBUG VEX Robotics retail kits. Which is also partly why there are 66x of these in the VIQC Next Level playing field. If you are attending VEX Worlds: for the past two years, we have given away the game-specific competition elements following the conclusion of division playoffs and awards, for free to teams in attendance. Please do not mob the fields like a Black Friday 5am sale! We’ll put available free parts into the aisles for teams to pick up during our clean up. 2x each of the 228-2500-1954 7x Pitch Diameter Balloon Tire (Smooth Tread) and the associated 228-2500-1953 2x Wide, Ø48.5mm Diameter Hubs, which can be effective as compliant / flexible intake wheels for various objects. Both of these are Jet Black in this kit. The 0.5x Pitch Standoff Extenders are great, because you can snap these onto the ends of existing standoffs to make intermediate lengths that currently don’t exist. A great source of these is the Gatling Rapid Fire kit, which contains 27x of these 0.5x Pitch Standoff Extenders in Jet Black. The Trebuchet kit is the second best current source for these 0.5x Pitch Standoff Extenders, clocking in at 12x in Orange. 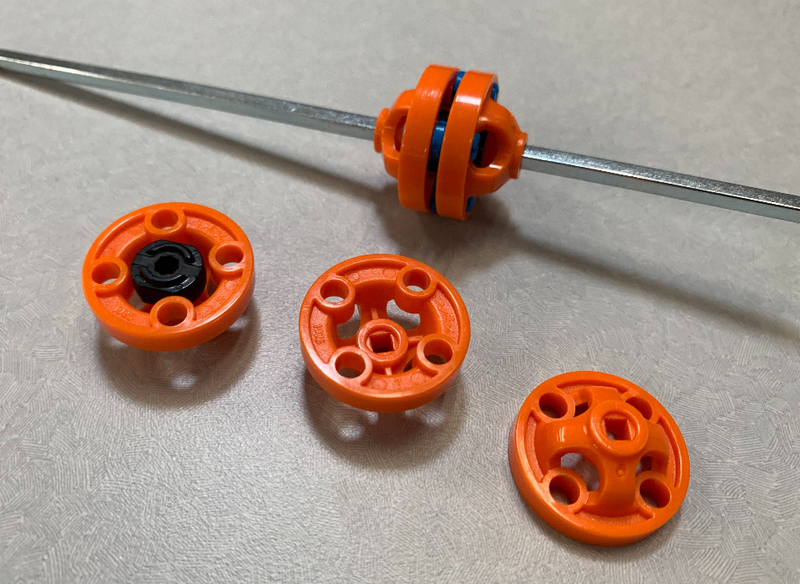 The Trebuchet Kit also is the currently exclusive source for the 6x Pitch Flywheel (75 gram) weights, which might be useful for counter-balancing some VIQC arm mechanisms. So to sum it all up, just a long advertisement for you to buy various HexBug kits. Jk, I’m sure this was helpful for many IQ competitors. @Gameoa – I was happy that he broke things out to help decide what kits to go get. The minoutar looks cool, but it’s so hard to go “VEX is NOT Battle Bots” that buying a battle bot seems wrong. For what it’s worth Best Buy has stuff on sale and I go pick them up to rip apart for parts. The 0.5x Pitch Standoff is a favorite so I can adjust and once I get the right size go back and put the right ones in. @Art_Dutra_IV Don’t be teasing with a “VEX IQ add-on pack”. I do love how most of the field elements are VEX components, my teams made big use of the big flat panels from last year’s game. The long blue 2x are going to be in demand next year.